Wasn’t Buffa10 just about the most fun you’ve had as a garden blogger? He (or she) then met with an untimely death. Then I saw that some critter has eaten off nearly an entire row of sunflowers, leaving just the tallest ones. Who eats sunflower plants? It’s not a trick question. The answer is… rabbits!! And here I thought they were gone. And in my little grouping of container plantings under the honeylocust tree I saw that most likely a chipmunk devoured an entire double-flowering impatien. I’ll spare you a picture of the carnage. You can just imagine it. Nothing is left of the plant. Other than those issues, the garden got along okay without me. This morning I picked green beans and squash, including a great big ‘Cue Ball’ squash that had to be sacrificed to the compost bins due to its size. I also noted the first blush of red on the ‘Stupice’ tomato variety. It won’t be long now before I have some ripe tomatoes to brag about! I swear I had the harvest in a basket to take a picture of it, like I usually do, but when I uploaded the pictures I took, this is the only one of the harvest. It shows the relative size of the new patio. It is about 30 feet wide and 21 feet to the tip of the curved edge. I love it and am still amazed when I open the back door to step outside that it is my patio. That’s pretty much it from my garden. I think now it is time for a nap, for me to close my eyes and strategize on how I will outwit the critters who want to eat in my garden before I do. P.S. I forgot to mention that I can see the silks on the little ears of corn. Hopefully, I won’t end up with raccoons in the garden trying to get to my corn before I do. I’ve got my hands full as it is with chipmunks, hornworms and rabbits. I don’t need raccoons, too. 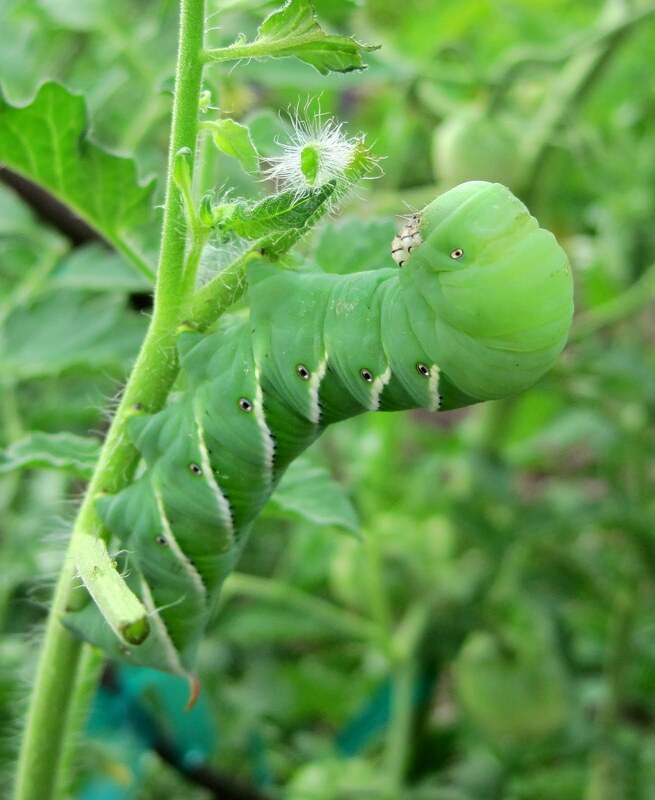 I don't know what I'd do if I found a hornworm on my tomatoes, as I know they're the larvae of the hummingbird moth, which I long to see. Guess it will depend on whether I long to see tomatoes more. It was really, really great to meet you at Buffa10. Thanks for sharing all your bloggingability with us. And frequently making us laugh (insert laughter here). Ew, ew, ew! I hate tomato hornworms even more than I hate Japanese Beetles. We'll be getting them in our garden soon - is there any way to prevent them, other than spraying? Which I don't like to do but will if I'm desperate enough. Appears everyone had fun in Buffalo. I don't take chances with those pests either, squash them but good! 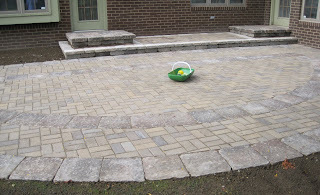 I still like the look of your new patio. I hate! hate! hate! tomato horn worms. I had very bad experiences with them two years ago when I planted Zucchini, They totally destroyed the plants snapping them in half.. Yes! Coral Stump every one you find! It's Great that you took a nice little vacation and now have the strength to go to WAR! You are TOO funny. :-) Lovely to see you again Carol! Look at that beautiful patio! And with a trug for scale--how thoughtful. I'm finally seeing some pics. My heart is at ease. This normally peace-loving woman turns into a cold-hearted killer when it comes to tomato worms, too. No mercy here. 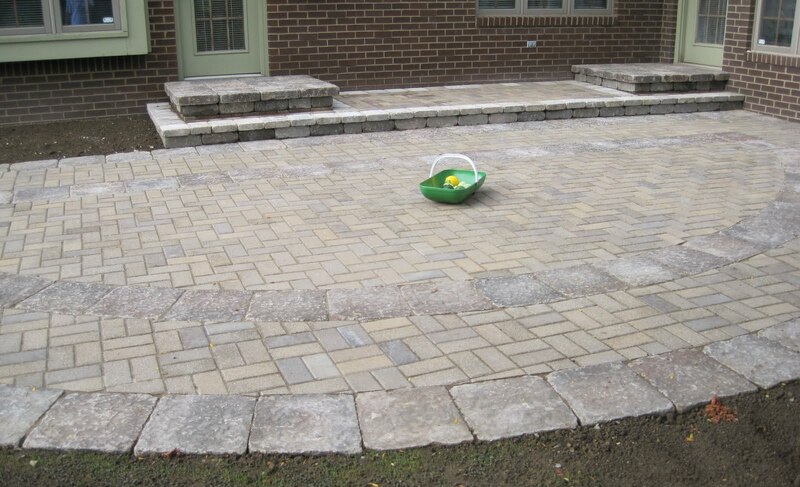 Your patio looks beautiful, Carol! Quick! Get out the plastic spoons!